Between rupturing my Achilles on May 18 last year, to the moment I made my comeback last Friday night, Edinburgh played 17 games in the Pro14 and six in the Champions Cup, while Scotland played 12 Tests everywhere from Edmonton to Edinburgh. That's a lot of games to miss. I might have appreciated the break from having my body battered from one month to the next, but it's good to be back. On Saturday, we have a Champions Cup quarter-final against Munster at BT Murrayfield. The word is that there's going to be about 40,000 people there. It'll be huge. Munster have won 13 of these quarter-finals over the years, but I doubt their supporters remember too much about them. What Munster people remember - or remember most fondly - are the two finals they won. That's what it's all about. You don't get a medal for coming this far. If you lose, you go home and nobody remembers that you were there in the first place. That's the way it is. Without looking online, I couldn't tell you who made the quarter-finals this time last year. I know the Scarlets did because I was playing for them. I know La Rochelle were there, too, because that's who we played against. Leinster and Racing were there as well, but I'm not sure I could tell you who else made it. You have to have bigger aspirations than just making it to the last eight. And Edinburgh have those aspirations just like everybody else. The achievement of making the quarter-finals or semi-finals is quickly overshadowed by the disappointment of going home without a winner's medal. What must Edinburgh do to get past Munster? If we are being honest, not many rugby supporters - even the most ardent of Edinburgh supporters - would have put Edinburgh anywhere near a European final at the start of the year. Two one-off games is what separates this team from that reality. Europe is in Munster's DNA. Two European Cups, two other finals, semi-finalists another nine times on top of that. It's an incredible record. Their pedigree is great, but this is something we spoke about at the Scarlets when we were about to play them in the Pro14 final a few seasons ago. Just because you have that history doesn't guarantee you future success. It's not something we should be intimidated by on Saturday. This is a different Munster team. A lot of that success belongs to a previous group. Don't get me wrong, they're still incredibly consistent in making it beyond this stage. They're a hard team to beat no matter where you're playing them, but we believe in ourselves. Last season, Edinburgh went to Thomond Park in the knock-out round of the Pro14 and lost. That game was in Richard Cockerill's first season as coach. It was early in his reign and I'm not sure all of the boys fully realised what a great opportunity it was. You always have to give Munster respect, but I think they gave them too much respect that day. By the time they started to play and started to realise that they could win, they had just a little bit too much ground to make up. The boys are a year older and a year wiser now. Rugby at this level is a game of fine margins, and the margins are narrowing, I believe. For me it's just a massive relief to be part of it. I made my comeback last Friday night after 10-and-a-half months out injured. It's funny how the mind works. I wasn't nervous about the match during the day, then I started getting nervous because I wasn't getting nervous. Practically a whole season out was a hell of a slog. A nightmare, to be honest. It was a tricky period in my career and in my life. Friday was about excitement in playing again, but also it was about relief at making it back when there were times when I wondered if I might not. Even a couple of months ago I was thinking, 'I don't know how I can play again'. I felt so far away from serious rugby. I ruptured my Achilles, then I got deep vein thrombosis, which complicated things. My initial comeback goal was December, then it got moved back a bit and back another bit. In November - seven months into my rehab - I couldn't lift my left heel off the ground. I was supposed to do it 20 times in a row before I could move on to the next level and start running and I couldn't even do one. I mentioned after the game on Friday that I hadn't felt like a rugby player for a long, long time. For the last 10 months, the most important task for me was being able to do 20 calf raises. This sums up the strange reality of being an injured rugby player. Goals quickly change, and can seem trivial, but to the rehabber, these are the vital stepping stones that get you one move closer to the pitch. The physios came up with a plan to help me, which involved looping thick rubber bands under my armpits attached to a bar above my head. Then they lifted me. I was like a puppet on a string. In the beginning those strong bands were the only things that were getting me to lift my heel. Then we went with medium-strength bands. This went on for five weeks. Eventually I did it 20 times on my own. In a strange way, I think that day was as memorable as when I played on Friday. It was a big breakthrough, a glimpse of the finishing line. Saturday will only be my second game for Edinburgh, but it's an exciting place to be. The competition for places, particularly in the back-row, is what you'd expect at a club that's got ambition. Bill Mata is one of the best players in the world in the way he carries and the way he impacts on a game. His number of positive involvements is incredibly high. Hamish Watson is the same, He's good over ball, carries brilliantly for somebody his height. I don't see many like him. He's one of the best open-sides around. Jamie Ritchie has played mostly at seven but was a stand-out performer during the Six Nations. Magnus Bradbury can arguably play all across the back-row. These are young, abrasive guys who are learning fast. Both of them had a big impact during the Six Nations. There are others coming through as well. When I played against Leinster last weekend, I knew I had to have an impact if I was to have any chance of playing this week. The last Champions Cup match I played was in April last year, when the Scarlets lost to Leinster in the semi-final. Leinster had a formidable pack and some x-factor players out the back and they had a brilliant consistency about them. That's where we want to get to. We're better now than we were a year ago. The pack is experienced and attritional and we've got plenty about us in the backline. Darcy Graham has been something special. He's appeared on the scene like a missile. James Johnstone has been excellent. Henry Pyrgos' experience and his ability to get us playing fast rugby has been very important. We've got some stardust, but we know what we're going up against. I longed for days like this to come again. It beats doing 20 single leg calf raises. Just. 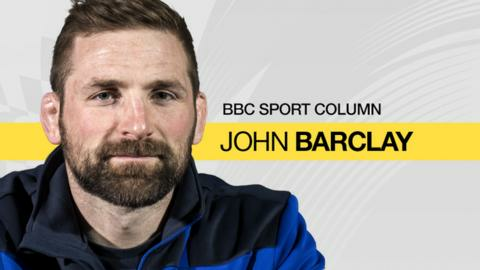 John Barclay was talking to BBC Sport Scotland's chief sports writer Tom English.